Robyn: Hi everyone, welcome to CoachStreet, Episode 12. I’m here with my co-host, Andrea Lee. Hi, Andrea. Andrea: Episode 12—that’s a dozen! Robyn: That’s a dozen, I know. Andrea: Next time it will be a baker’s dozen. Robyn: Yeah, we’ll have to make it special. Number 13 can be really special. But this is pretty special, too, because this one is on credentialing and certification. How do you like them apples? Andrea: Good. I like them with caramel on them, if possible. 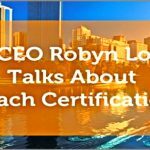 Robyn: There’s a lot of debate in the field and a lot of debate with our new students on certification, credentials—not even a debate—I’ll say, going back a step, a lot of confusion. You have to understand it before you can debate it, right? Andrea: That’s a good point. Touché. So what is certification and what is credentialing? Shall we start there? Robyn: Okay. Certification is a certificate that you get at the end of a course. You can get that certificate from your training provider. If you go to a university you get a certificate. If you go to a short course you can get a certificate. If you go to a scuba diving course you can get a certificate. That certificate will be from the school or the training company that delivered the training. 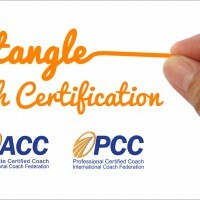 I don’t even know if credentialing is used in the same way in other professions but in coaching a credential is something given out by the International Coach Federation (ICF), a peak body, and it’s little letters beside your name that designate a certain level and expertise in coaching. In Australia, a great example is the AMA, the Australian Medical Association. That’s a peak body and you can apply to them to be credentialed with them. Accountants have the same thing. That’s my understanding but let’s have another go at that from your perspective on those two definitions. Andrea: In this case let’s shock and awe our listeners. We have complete agreement as to the definitions. Now, when we entered the topic you might have found some sparks flying but as far as what they actually are, that’s a great way to describe it. Robyn: You know, there’s a third term which I’m going to go into right now and describe and that’s accreditation. That’s also something that’s confusing. So there are actually three terms here that new coaches need to get their heads around if they’re trying to understand this. One is certification. One is credentialing. And the other is accreditation. I do see them used all incorrectly, all over the place. Accreditation is something that happens to a program, not an individual. So a program can be accredited. For example, in the coaching profession we have the International Coach Federation, ICF, a peak body, and schools can apply to the International Coach Federation to have their program accredited. So it’s not even the school that’s accredited. This is something that a lot of people are not clear on. A school is not accredited. An individual is not accredited. It’s the program that’s accredited. So a coach training school might have 12 programs and only one or two are accredited. The process to get that accreditation is quite rigorous. It’s quite similar here in Australia to what you need to go through to get an RTO status, which is Recognized Training Organization. It took us about 12 months when we first applied many years ago. I think we were one of the first, if not the first school in Australia to have a program-accredited. It’s quite a detailed process. As a school, you need to submit your curriculum to the International Coach Federation. What they do is map that across their competencies. There’s another word—competencies. They have decided these so-many competencies that are listed, are what make a good coach. The ability to listen actively, the ability to ask powerful questions, whatever those competencies are. The International Coach Federation looks at the curriculum of the school, maps it against the competencies, and decides whether it is adequate. They also will look at your faculty, look at the trainers, look at their experience and background, and decide whether that’s adequate. Then they’ll look at the professional development plan of the school. So the school needs to have something in place where trainers are always being developed and nurtured. Then they’ll look at your systems for student management, your accountability. They’ll do audits and make sure that your recordkeeping is accurate. They’ll look at your assessment and make sure that maps across okay. It’s quite a big process and that will result in a program getting accredited. Are you still here or did you have to go lie down? Why Get Certified or Accredited? Andrea: So from the perspective of a coach, I think the important thing here is to ask that pointblank question, “What’s the benefit of getting certified or taking a program that is accredited,” for any of this. Why does this matter to a new coach or even a veteran coach who is thinking of getting a graduate level or advanced coach training? Robyn: So Robyn draws a big breath and prepares to answer! Okay. I’m very interested to hear what you think about this, as well. My answer to that is it doesn’t matter in many cases. In many other cases it does matter. For me, speaking as the CEO of a coach training school, I think it matters a lot and I think it’s very important. My reasons for that are that I think coaching as a profession, because it’s not—what’s that word? You know, like counseling and therapy? Andrea: It doesn’t have a governing body. Robyn: Because it doesn’t have that then it’s really important that there are policy guidelines and ethics that can be upheld. There other alternatives to the International Coach Federation, which we can get onto later, like the IAC and other organizations. The International Coach Federation is one place that does that and it’s the largest and it’s global. So I support the International Coach Federation in developing all the things that they do to make sure that coaching as a profession is the best that it can be and has the most integrity possible. 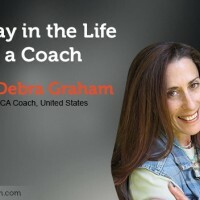 They make sure that all the coaches who are coaching are doing the very best by their clients, so I totally support it. We do a lot of work to support the International Coach Federation and always have done that for that reason. That’s also the reason we chose to align with them when we were choosing how we would set up our training. We could have chosen to align with, in Australia it’s called CERT IV and RTO. We could have chosen to align with all sorts of different bodies that every country’s got for their training or qualifications training frameworks. They differ in all countries. We specifically chose the International Coach Federation and International Coach Academy because it’s global and coaching is a global profession. Most of our graduates coach over the phone. We encourage them to be global because it’s a much bigger market for clients. It therefore stands to reason that having a global accrediting body is a good way to go. And secondly, because they’re the most developed, with the largest number of members. The third reason is we think the work they do is really great. So that’s my answer to why it’s important and why we chose to align with that. What do you think? Andrea: I absolutely at a meta level I agree. As somebody who used to work at a coach training company who was part of the founding group that brought together a different certifying body than the main one, International Coach Federation, I will say I agree. I think it’s really important that we support the structures and organizations that lend credibility in the public eye to our profession. From a practicing coach perspective, I have never been certified. I actually hope to write some of the exams. I have the experience and hands-on opportunity to be grandfathered into certification but I chose not to. It’s not because I don’t have respect for it. It’s simply because I knew that starting that process for me meant that each year I’d have this dilemma of do I renew my certification? My personality is just one that I’m not good with rules and authority. That’s why I’m an entrepreneur. I have managed to choose and built several iterations of businesses that have involved coaching and never been certified. So I represent the other side of the spectrum. There are reasons and seasons to go for certification or not go for certification. That’s probably the most politically correct way I can put it, Robyn. Robyn: Look, I think for someone like you, I can totally see that there’s not a need to be credentialed, particularly at this point. I think you could even say it’s a rule of thumb that the more experienced you are and the more seasoned you are as a coach and the longer you’ve been in business, the less need there is to get credentialed in particular markets. Your market is one where it’s probably not necessary in a small business market. But I think that definitely for new coaches, if I was starting now today and I was a new coach, I would do it. I would do it because to me it’s a no-brainer. Why not do it? It’s a really great thing to get that certification. It is becoming more and more recognized. For example, I heard a story the other day about someone working with the Department of Defence in Canberra, which is our capital city here in Australia, and they were introducing a corporate coach training program. The Department of Defence would only employ coaches who were International Coach Federation-certified. Andrea: Definitely. That’s happening more and more. It’s understandable, it really is understandable. The difficulty with my position I’d say in a debate is that I consider myself an upstanding coach of deep integrity and sometimes I can get a little self-righteous sounding because I feel so strongly about doing things well on behalf of my profession and being an upstanding coach. Not everybody is like that so in the coaching profession the word “coaching” can easily be co-opted by people who are not of that same ilk. So I totally support what you’re saying. Robyn: I was very surprised to hear that because I couldn’t believe they even knew about the International Coach Federation. That just tells you how far the ICF’s reach is now. Also, they’ve done a lot of work over the last 10 years outside of the U.S. That was another weakness in the early days. They didn’t really have any good chapters in the Asia Pacific. But if I was coming in now as a new coach and was really into coaching, and let’s say I could have been a consultant for the last 20 years and now I want to add coaching. To me it’s just an added value. You’re already going to get training as a coach so why not choose a school that offers you the International Coach Federation credential as well so that you can put those letters after your name? Andrea: Okay, here’s the question I have for you. This is putting you on the spot, which I love, but I think one of my main difficulties with certification and accreditation is that it seems to me from the outside, so long as a coach training organization is willing to fulfill certain requirements for paperwork and hours, it seems like almost anybody can get accredited or certified. As long as they take a course and pay the money and jump through certain hoops, they can get certified. But it doesn’t necessarily reflect the total picture when it comes to skill as a coach. Or excellence in a coach training company. Now, International Coach Academy is one of the best schools if not right at the very top of the best schools in my opinion, but it’s not because you’re accredited. So what would you say, Robyn? It’s not necessarily or only because you’re accredited. My question to you would be—I’m really putting you on the spot, aren’t I? Robyn: I’m up for it. Andrea: I know you are which is why I’m asking. When people are shopping for a school, how can you tell that the school is really one of the good ones? Speaking, of course, from your position. It’s more than just whether it’s accredited. Robyn: I would ask the school how many students fail. That’s what I would ask. Andrea: That’s such an amazing question. Robyn: The schools that say, “None, because we’re so good no one fails,” well, wrong answer. “Supervised Coach is where you bring a real client to the call and you coach the client and you are supervised by a high-level coach who is an Master Certified Coach or Professional Certified Coach themselves. You’re supervised against the competencies and sometimes you will fail that. So that’s the first thing I’d look at. How many students fail? Not to bang other schools but it is an issue that I think some schools do just pass everybody. That’s happening in universities now. It’s happening everywhere because government funding’s tied to outcomes. There’s really a vested interest in pushing students out and there’s no vested interest in failing them. It’s an issue in all of education and training, not just in coach training. Andrea: So listening for a really candid answer about what happens when student in a coach training company don’t get their certification, I think I’m so limited in my experience in this area that that strikes me like a lightning bolt. It’s really a transparent and yet very fair, very reasonable question and very revealing. The way that a school answers that question undoubtedly is going to tell you if they’re really up to no good and just passing everybody or it’s a sincere endeavor to keep the bar high as far as quality. If you’re thinking about getting that certification, know that you’re going to have support. You’re not just signing up for a school who just wants your tuition or whatever at the end. That’s beautiful. Does Certification Tie in With Skill? Robyn: There’s another answer to that, as well. Does training certifications or credentials necessarily tie in with skill? Are these things mutually exclusive? If you take like a landscape architect, for example, and put them through three or four years of education, they can get a qualification at the end. Then you can have another landscape architect who’s not done a single bit of training or education and doesn’t have a piece of paper but worked for their father or mother’s landscape architecture firm for 15 years. You can put both those landscape architects in your backyard and there might not be any difference. Or it might be that the one who didn’t have the training is actually better than the one that had the training. So this whole thing about practice-based learning and doing training for the sake of a piece of paper, this is the case everywhere. What I would say to that is that if you’re new and looking for coach training, also ask about how the theory connects with the practice and what the school does to make sure that the theory connects with the practice. And the other thing is, just stay away from the schools that say “International Coach Federation Certified. You can get your Professional Certified Coach in 40 hours, Faster, Quicker, Better.” It’s not. It’s not better. So that’s the other answer to that. Andrea: That’s a good one. I was deep in thought—you’re making me challenge so many assumptions. Robyn: Well, people do have a lot of assumptions about that training. If I’m going to choose a coach tomorrow, I will look at whether they’re certified but really and truly I’m just going to have a session with them. Then I don’t really care about the piece of paper because it’s going to be whether that coach is right for me. So that’s the other part of the answer. Do I think coaches should get certified? Yes, I would. Why not? Andrea: Here’s what I would say to that, Robyn. I support that although I would never fault someone for not. It’s a lot of time and effort. It does cost money. If you are getting training anyway, I absolutely agree with you. I have a bias or two about the organization to get it from. This is why you’re seeing me partner with you on CoachStreet. But the thing I would say is that it’s not a substitute. Deciding to do that is not a substitute for getting out there, putting your feet on the ground, and coaching real people. If the program you’re in is worth its salt you will increase exponentially the amount of actual coaching you do. Nothing is a substitute for that. If it came down to a situation where someone said, “Well, I can do either the certification or coach real people,” hopefully the certification includes real coaching but putting that aside for the moment, just coach people. Don’t let it be one or the other. Robyn: Look, I think the thing is if you go to a school that has been set up by an educator or someone who has a good background in training and development, then ideally the course should be designed around practice and skills, not around certification. This is another issue that’s happening. I think the International Coach Federation is probably heading in the way that sort of encourages it more. They’ve brought some new guidelines in that you have to submit an oral exam now to go for your Professional Certified Coach. I think it comes into effect April of this year. In the past, if you went to a school that had an accredited program and you did your requisite number of hours, for example, Professional Certified Coach is 125 hours and so many hours coaching. You tick those boxes. Then you could apply to the International Coach Federation to get credentialed and they would also just tick a box because the program you went to was accredited. If you go to the International Coach Federation without having done an accredited program–you might have done another program that is a coach training program but it doesn’t have Accredited Coach Training Program status, then you have to apply to the International Coach Federation through what they call the Portfolio Track. That means the onus is on you to prove that the course you did maps against their competencies. It’s a much longer process and you have to sit an exam. What they’re doing from April onwards this year is that everybody who goes for Professional Certified Coach has to sit an exam. So it really doesn’t give a lot of benefit. It really means that the Accredited Coach Training Program status is probably worth a little bit less than it was. But also what it does, in my opinion, is it starts to create courses that are designed around the credential, not around the skills. So what I mean by that is when you go look online at coach training schools and click on their curriculum tab, I’ve seen a number of courses that are just basically a copy-and-paste of the competencies of the International Coach Federation and they’re set up in exactly the same way. So you have to do an exam, an oral exam, and they’re really just prep courses like those courses you can do if you try and pass the ESL language component for a certain country so you can get a VISA. There are a lot of those courses that will prep you on the exam. That’s what I see happening to training. I don’t like that at all. It also happens in other areas. What I would like to see happen, ideally what a course should be is that the course should be authentic and valuable learning. In the first instance you look at the student, you look at what they need to learn, and you create authentic and valuable learning. Then you look at your competencies for whatever body you’ve decided to align with and you make sure they map across. If they don’t, you tweak them. Before I get off my soapbox, even assessments should be like that. In International Coach Academy, for example, we look at our assessment. Assessment should not be just for the sake of passing a competency. An assessment task should be something that adds value to that coach on top of passing the competency. An example is we have coaches do a research paper. We have them create their own coaching model. And then we look at how that maps against the competencies. We make sure it maps across. What happens is our coaches leave the program with something valuable in their hands they can actually use. They’re not doing the test for the sake of doing a test. I can’t stand the test for the sake of the test. I’ll step down. Andrea: No, that’s great. What do you think is the future of this conversation? Where are we going? Is it going to be more and more smart to get certified or is it going to become less important? Robyn: It seems to be becoming more important. What I wouldn’t want to see though is that the credential holding less value. I don’t know what’s going to happen once this gets put into place in April. We’ll definitely see some changes. Robyn: The other trend that’s happening as well that I’m noticing a lot is that we have a lot of coaches coming now who are already experienced coaches. So not only are they experienced consultants or managers or whatever, they’ve also been coaching for a few years and they decide they want the credential. This is an interesting case, too, because you have students coming in who want the credential but they already feel like they’re coaches and they know quite a lot of the stuff. In many cases they actually do. So if I could wave a magic wand and change one thing about the International Coach Federation if would be their policy on RPL, Recognition of Prior Learning. I know you’ll agree with this because the IAC, which I think is the body you helped set up? Andrea: Yes. International Association of Coaching. Robyn: The IAC is based on proficiency so if you’re proficient, if you are competent, you get the credential. It’s not about having done so many hours training. The two things I would like to change with my magic wand are 1) the requirement of number of hours which is a bit out-dated. If I learn fast then I shouldn’t be penalized and made to sit through another 60 hours of learning because that’s the number of hours. And 2) their RPL policy. At the moment the International Coach Federation doesn’t recognize prior learning. So if you have already done training—perhaps you’re a psychologist, for example. You really will have done active listening if you’re a psychologist. Then you probably shouldn’t have to do that module again. Universities do lots of RPL. You can come to a university and say, “Look, here’s my credential. Here’s what I’ve already done.” They can tick it off. I would love to be able to do that. We get a lot of students now that are already coaches and they have expertise. I could do a little RPL assessment with them which should take an hour or two, listen to a bit of their coaching, and I could actually say, “We’re going to give you credit for this unit, this unit, and that unit because you’re clearly already competent. Now you just have to do 75 hours and then you can get your certificate.” You can’t do that at the moment with the International Coach Federation. Andrea: I agree wholeheartedly. Unfortunately I think it’s undeniable that it’s slightly antiquated in that way. I know it’s not an easy thing to contemplate changing. It’s a real beast. I would not want that job. My hope and faith is that it is actually underway, that there’s some movement within International Coach Federation that is endeavoring to move in this more modern, science-based, learning-based direction. Robyn: I guess one of the issues is—maybe this is not such a big deal now as it used to be but—you do get a lot of people coming who think they already know what coaching is because they’re a psychologist or a teacher or a health professional. Actually, coaching is a different methodology and they may do a bit of coaching but they need to do a bit of un-learning first and then learn again. So I think that’s one of their issues. How do they assess that? Leaving it up to the schools, I can see why that probably is tricky, as well, because you would then have to have some quality process in place to make sure that the schools knew how to do an RPL assessment. Andrea: It’s very, very challenging. Let’s use this platform to really call it out. I do think that as time goes by, if we look into the future we will at a certain point be challenged as a profession on the basis of the foundation of how we certify and how we are not certifying. I’ll be the voice because I’m the one in the position to be able to say and observe. Coaches who are not necessarily the best coaches are getting the certifications. Coaches who are awesome coaches are failing at certifications. Robyn: There’s that, as well. Don’t even start that one. At the high level, at the Master Certified Coach level we’ve had two people who have really, really good coaches and they failed on their first time around at the Master Certified Coach. I don’t know. What do you say? Andrea: I think it’s exactly what we’ve been saying. We need to not rest on this. We have this machine and it’s running. Coaching has an incredibly bright future and we still have yet to tap into all of what coaching as a software for human existence can do. I don’t see a new technology, a new software, a new thing that is going to continue to help us succeed and thrive as human beings as superseding coaching. Really it’s up to us, leadership in the profession, to think about these things. Hopefully the podcast has eliminated a little bit of it. Robyn: I think the schools can do a lot, as well, for different student types with different types of courses. The student type that I was talking about just then who are already experienced and might have done 60 hours of training somewhere else, we now have an advanced coaching program for those students who are just coming into 70 hours. They still have to apply via the Portfolio Track through the International Coach Federation but at least they don’t have to do the fundamental what is coaching, active listening modules. So there are things that the schools can do. That’s the problem with big organizations like the International Coach Federation and big accrediting bodies. It’s never perfect; there are always problems. It was like that when I worked in adult literacy and the frameworks. We were always complaining about the frameworks. But at the end of the day, you’ve got to have some frameworks. Andrea: Yeah, I agree. All I ask is that we acknowledge that. Let’s not stay still; let’s not have stasis. That’s all. So, Robyn, what’s going on in your world? I know part of the finals of these coaching episodes is to hear what’s new and exciting. Are you still in a heat wave? Robyn: No, actually we survived the heat wave. We’ve been putting a lot of effort into our coaching tips videos, which you’ll see on our website. We’re sharing them on Facebook. They probably look pretty easy, being only three minutes, but it’s been amazing teaching some of the staff and coaches here at International Coach Academy how to use video. I don’t know if you know this but my first degree was in filmmaking. Andrea: I had no idea. Robyn: So it sort of comes easy to me, the technology and video and audio and stuff. So I’ve been teaching the staff how to get good quality video. We could even do an episode on this because it’s not that difficult but so many people don’t know the fundamental things of sound, lighting, and framing. So I’ve been teaching that and we’ve been getting these great little coaching video tips published with transcripts and summaries and it’s very, very cool. People are loving them. So that’s what we’ve been up to. Andrea: I’m so excited. I think that’s a great topic. Of course, as far as what I’m up to, I’m up to something new and exciting with you guys. Robyn: Let’s tease with Business Building coming your way soon. Andrea: I’m just thrilled. I couldn’t be happier to bring what I have, for what I have, to International Coach Academy students to make their vision of a great coaching business come true. You just tell me where to show up and crack the whip. I will ask how high to jump. Robyn: Well, hopefully by the next podcast we can share more details. All I think we can say at this point is the motivation behind this is that for many, many years we’ve looked at this issue of business building at International Coach Academy. We’ve looked at what other schools do. Some schools actually do it themselves, which we did do a couple of times, but in the end what we’ve decided to do is focus on our core business and what we’re really good at. We’re really big at acknowledging expertise. That’s what we’re really good at. What we’ve decided to do is partner with the best business builder of coaches in the world, which I happen to believe is you. So that’s where we’re heading and we can share some more details coming up. Andrea: It’s an honor, really. I’m looking forward to getting to know many of you. I believe strongly that a business is really a work of art, especially for a coach. It can be built in a way that really suits the shape of your soul and your values and be a mighty contribution to the world. So stay tuned until next time. Robyn: And don’t go looking on the International Coach Federation website for competencies related to business building. Just saying. Andrea: Thanks, Robyn. It’s always fun. Robyn: Thank you. See you next time. 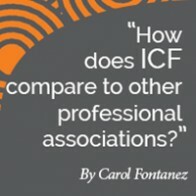 Research Paper: How Does the ICF Credentialing Process Compare to that of Other Professional Associations?